You are at:Home»Herbs»Cinnamomum zeylanicum Blume. Latin name : Cinnamomum zeylanicum Blume. Description : Darchini is useful for stomach and digestive complaints and boosts absorption by means of intensifying your body’s capability to thoroughly collapse and soak up nutrients from food. Further alleged advantages of Darchini involve: combating fungal infectivity, alleviating sickness, remedying diarrhea, intensifying peripheral circulation, heating up the body, lessening blockage and curing uterine hemorrhage. It may possibly help in lowering cholesterol and triglyceride levels and supporting hearth strength. These performances are founded mainly on subjective and not scientific proofs. It helps calm the stomach. 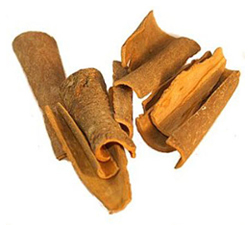 Cinnamon (Darchini) is used for stimulating gastric and digestive juices and carminative. Recommended Dosage : Bark :- 375 mg to 2 g powder; Oil : 1 to 3 drops. For external application only. Contraindication : If pregnant or breast-feeding do not consume more cinnamon than is normally present in food. Men with prostate problems, diabetics and those taking blood thinners should consult a health care provider before using this herb. This product is not recommended if you have a tendency toward excessive menstrual bleeding. Taking this herb and antibiotics together may make the antibiotic not work for you. Increased heart rate (pulse), feeling dizzy, shortness of breath and redness of the face may occur if you take too much Cinnamon. Undiluted essential oil in their purest state is extremely potent, and should be blended with a carrier oil or other medium prior to use directly on the skin, as the essential oil may cause irritation.